Winners of the 2019 Safe Jobs for Youth Poster Contest stand next to their winning designs: Elizabeth Trull of Rockland (l-r), Oliver Leventhal of Arlington, and Ethan Dollarhide of Fall River. 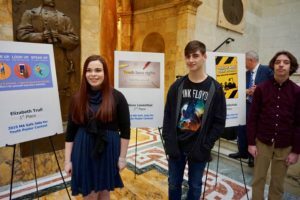 Winners of the 2019 statewide “Safe Jobs for Youth” Poster Contest were recognized at a State House event on Thursday, March 14. Elizabeth Trull, 17, of Rockland, won first place, taking a home a cash prize of $500. Her poster will appear on MBTA vehicles this spring. Oliver Leventhal, 16, of Arlington, won second place and a $300 prize, and Ethan Dollarhide, 16, of Fall River, won third place and a $100 prize. The prizes were funded by Commonwealth Corporation, which is part of the Massachusetts Youth Employment and Safety (YES) Team. Receiving honorable mentions were Audrey Bronson, 18, of Southampton; Hannah Chace, 17, of Fall River; Kaitlyn Gordon, 17, of Seekonk; Ethan Masters, 15, of Arlington; Victoria C. Rodriguez, 15, of Berkley; Rachel Shaw, 16, of Sandwich; and Jonathan Young, 17, of Eastham. More than 200 teens participated in the contest and 61 youth served as judges, including workers from the Massachusetts Coalition for Occupational Safety and Health’s (MassCOSH) Teens Lead @ Work program. Two of those workers from that program, Trent Jordan and Clivohn Wilson, served as emcees for the award ceremony at the State House. Cecilia Luján from the Massachusetts Department of Public Health told event attendees that the poster contest is one way to make work safety part of the dialogue for teens, employers, educators and parents. Commonwealth Corporation President Dr. J.D. LaRock talks with Elizabeth Trull of Rockland about her first-place poster design. Diaz pointed to data collected through the DPH’s “Young Workers: Injury Surveillance and Prevention Project” that found almost half of teen workers in the Commonwealth who were injured at work between 2011 and 2015 said they did not receive health and safety training from their employer. 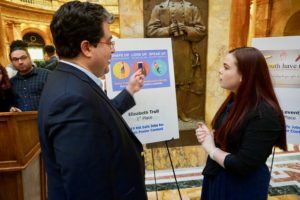 One of the posters included the statistic that the injury rate – both at the state and national levels for teenagers – is nearly double that of adult workers, Luján pointed out. The Massachusetts YES Team includes the Massachusetts Office of the Attorney General; Massachusetts Department of Elementary and Secondary Education; Massachusetts Department of Industrial Accidents; Massachusetts Department of Public Health; Massachusetts Department of Labor Standards; U.S. Department of Labor, including its Wage and Hour Division; and the Occupational Safety and Health Administration. MassCOSH is a nonprofit organization that promotes workplace safety through education and policy development and advocacy. 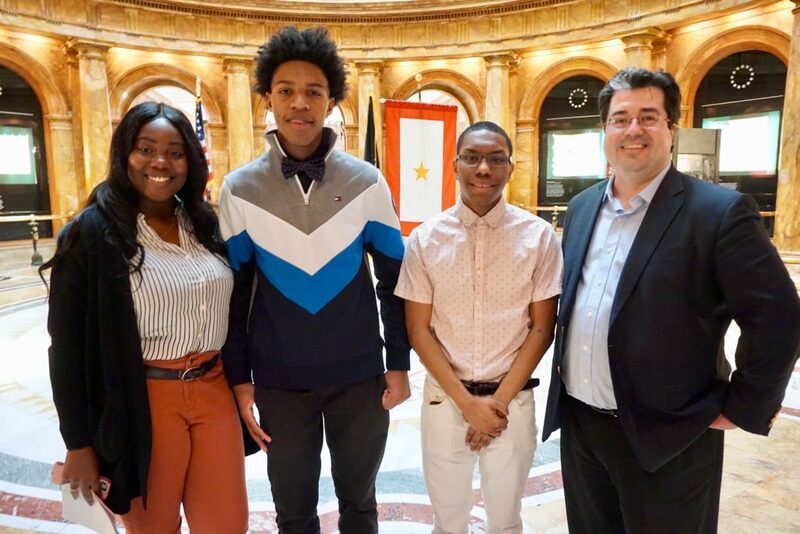 At the YES Poster Contest ceremony are Commonwealth Corportation Communications Coordinator Kayla Brown (l-r), Clivohn Wilson and Trent Jordan from the MassCOSH Teens Lead @ Work program, and Commonwealth Corporation President and CEO Dr. J.D. LaRock.